AFC - 03/31/16 Chinchillas Rule! 08/19/16 Public Discussion on Animal Protection Act Proposal! 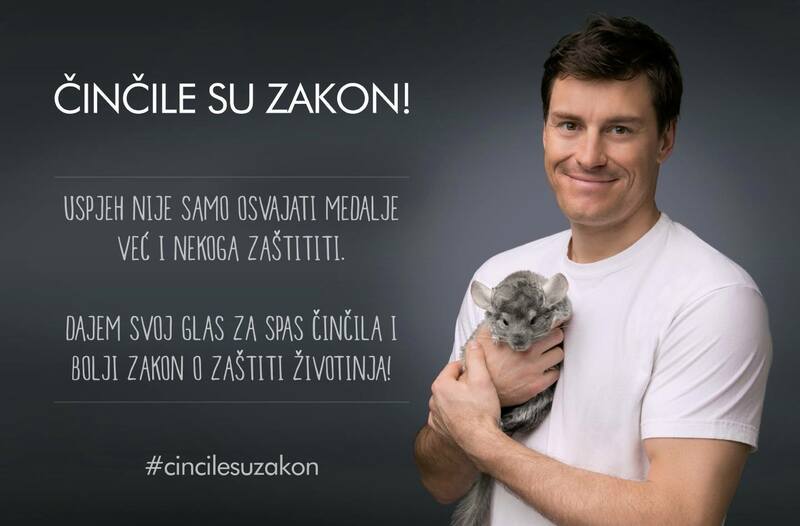 Zagreb, April 1st, 2016—"Let's save chinchillas and improve the Animal Protection Act" is the main goal and guiding thought of the "Chinchillas Rule" campaign. Although chinchillas are at present protected under the article that states that animals must not be farmed for fur, it has come under threat after nine years of the phase-out period. This rightly provoked Croatian public, with more than 70% of our citizens supporting the article and improvement of the Animal Protection Act. The initiative gained the support of the campaign ambassadors Goran Visnjic, Ivica Kostelic, Vanna, Luka Nizetic, and Iva Sulentic. They decided to loudly and clearly show their attitude toward fur, the importance of saving chinchillas, and the need for a better law for all animals. To entice compassion toward all animals and chinchillas, they posed for photos holding these animals and sent clear messages of support. 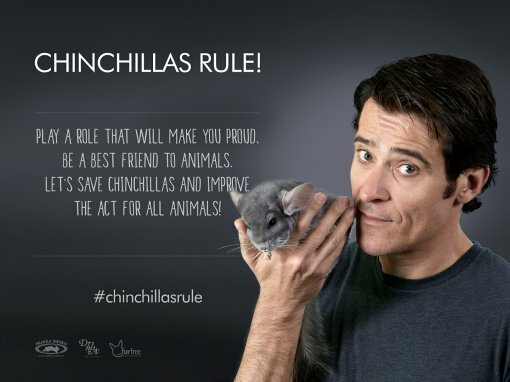 You can find their messages and photos on billboards across Croatia and the official Chinchillas Rule Facebook page, which will shortly also feature short videos of the aforementioned ambassadors in support of the campaign. The name of the campaign, "Chinchillas Rule", is a double meaning message which relates that chinchillas are such endearing, beautiful, intelligent, and interesting creatures who need our help, but also that they are already protected by law and should remain so. All changes to the Act should be in the direction of improvement and beneficial to animals, because, for example, killing dogs in shelters is still not banned, and neither are horse logging and similar practices that are unacceptable in a civilized society. As a reminder, Goran Višnjic already participated in an Animal Friends campaign ten years ago, in Collaboration with PETA. 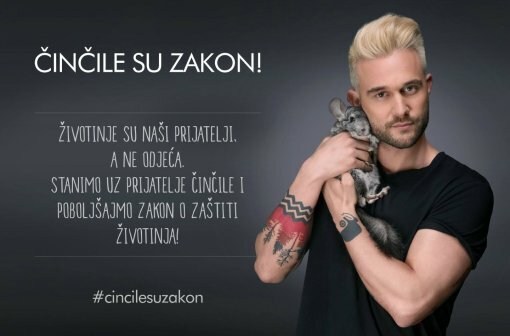 Fur farming was banned in Croatia shortly after his standing against fur. It was a great victory for animals and a civilizational achievement adopted by many other countries. Besides him, Luka Nizetic also joined Animal Friends' past initiatives, participating in our "For Croatian without Fur" campaign. 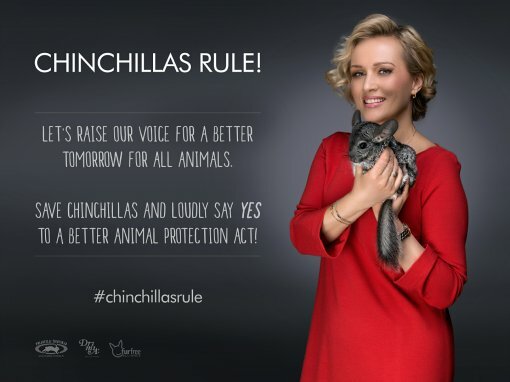 You can join the "Chinchillas Rule" campaign by signing the petition on the official website of the Animal Friends Association at www.prijatelji-zivotinja.hr. Check out the billboard designs, campaign messages, and additional information at www.prijatelji-zivotinja.hr and follow Chinchillas Rule on Facebook. The "Chinchillas Rule" campaign was co-launched by Animal Friends and the Drimia PR Agency. Recognizing the humanitarian and noble cause of the campaign, all its participants contributed by volunteering, and Jutarnji List, Gloria, and the Europlakat, Vektor Grupa, and Arto companies by media sponsorship. You can join the "Chinchillas Rule" campaign by signing the petition and adding "Chinchillas Rule" to your profile picture using this link. New independent candidate - Chinchi!